Here are a few pictures from Ecuador, and a brief summary of my mountaineering adventures there while working in Quito on a business trip. I took the new telefériQo up out of Quito (to 3950m), then scrambled up Rucu Pichincha (4705m) Saturday October 18th. It cost $8. I took the obvious path and followed it up rolling hills to the base of the steep rocks, then continued around the backside and zig-zagged up to a final scrambly bit near the top. Once I got above 4400m (i.e. well higher than the highest point in the Rockies, Mt. Robson's 3954m), I began to feel a little light-headed and even slightly dizzy, and I got a slight headache. Nothing that would hold me back, however. 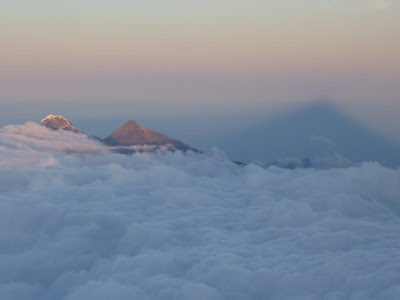 From the summit I got a good view of the slightly higher Guagua Pichincha and the intervening Padre Encantado. 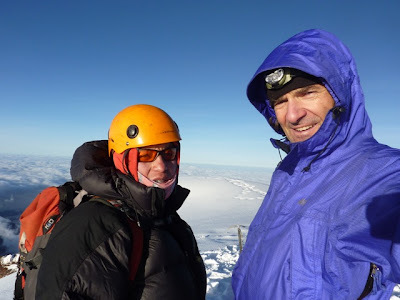 Also on the summit, I met some like-minded travelers and we made plans to go out the next day. The next morning, I got together with an American marathon runner named Jason from Plattsburgh, NY, Michele from IBM's Minnesota office and Juan Carlos from Bogotá at 6am, and we shared a hired car for a trip south into the countryside, then up a dirt road to a parking lot at 4000m, from whence we climbed Iliniza Norte (5125m). At the refugio (4500m) I met a local guide, Fernando Iza, who offered his services for the following weekend. 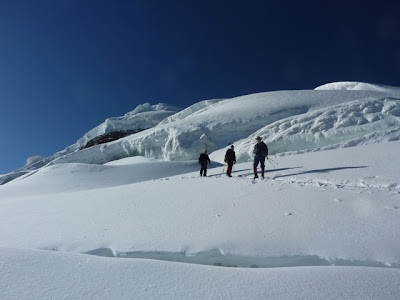 I teamed up with Jason, and, after mid-week gear rentals of expedition boots, crampons and ice axe, we got together on Saturday October 25th and drove with the guide to the parking lot at the base of Cotopaxi (4500m). Just as we started up the steep path to the refugio, the skies opened and we got hailed on for 20 minutes. The ground went from brown to white; quite a welcome! The guide said "la montaña nos está huachando". 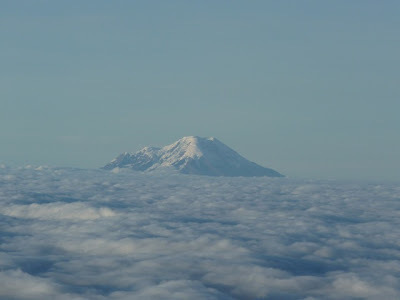 Basically that means that barfing the white stuff on us was the mountain's way of saying "welcome". Once at the hut we went out as a group onto the nearest snowfield and did some practice work with crampons and ice axes, including the all-important self-arrest technique. We stayed two nights in the refugio (4900m), which helped us acclimatize, as did the second day's excursion up to the toe of the glacier (5185m). I didn't sleep very well the first night, and had a continual low-grade headache, but it had cleared by the next morning. I also took a long nap the second day and felt fine by the second evening. On the second night we headed out just after midnight and started our ascent. At first, the going was easy, with the guide taking a slow, measured pace which I liked. However, after we reached the glacier and put the crampons on, he seemed to pick up the pace (or was it just gettting higher). It seemed like the trail grew ever steeper, and the level of exertion grew ever harder, until it felt like I was just sprinting up the mountain (though in reality I was just shuffling along at the same slow pace as ever, in all likelihood). I thought we would top out before dawn, but the "last little bit" seemed to go on forever. The sun popped out before we got to the top, which had its good side as I got a fabulous photo of the volcano's shadow. 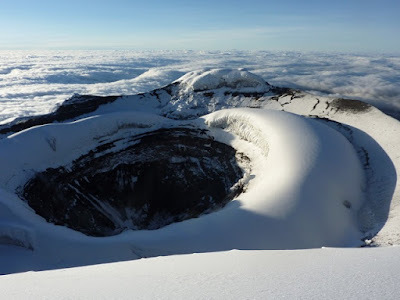 Finally, we reached the summit of Cotopaxi (5897m) at 06:15. 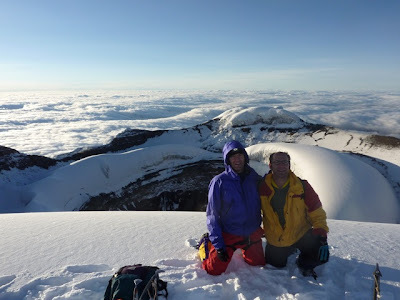 It was an intense physical exercise during the whole climb, followed by a powerful emotional response when I reached the top - I was overcome with tears of joy and a feeling of gratitude at being able to be in this very special place. As you can imagine, the view was spectacular. It took two hours to descent to the refugio, and another half hour to carry all my gear back down to the car. I was knackered all the rest of that day. 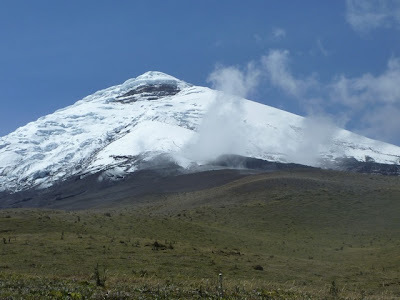 I decided not to attempt Chimborazo in the next few days, and instead went paragliding at Ibarra and touristing at Otavalo.